Noale, 3 June 2015 – The World Superbike Championship is about to take on one of the most popular tracks among the riders. Portimão is a decidedly particular track with impressive sloping sections that make for a great show, always keeping the fans on the edge of their seats down to the last lap. It is also a track that traditionally has favoured the Aprilia RSV4, the reigning World Champion bike, which has always proven to be competitive on the Portuguese track. This is an excellent reason for the Aprilia Racing – Red Devils riders to be optimistic. 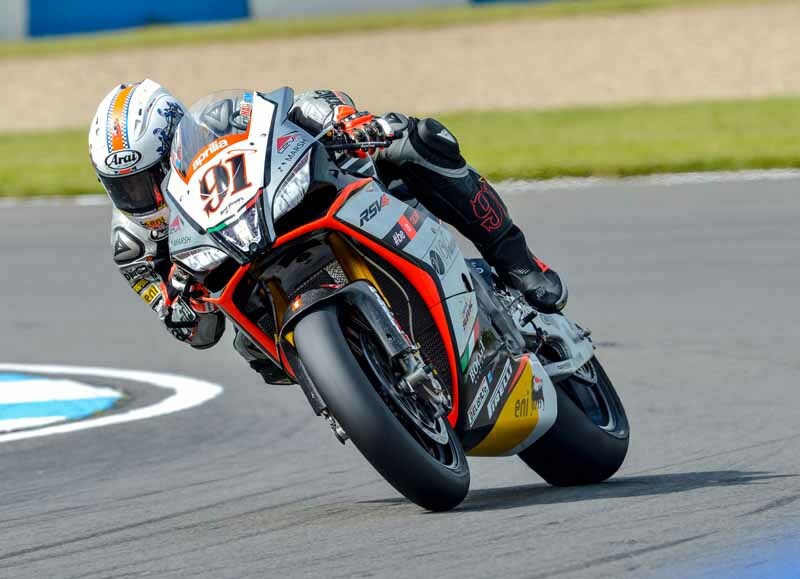 Leon Haslam is counting on this positive feeling and his decidedly improved physical condition, forced to battle pain in his home round at Donington Park but motivated to get right back on the podium. The few laps the rider took during the preseason tests here are purely indicative but they left the English rider with good memories. The race for the championship, with so many points still up for grabs, is wide open for Leon, especially in WSBK where sudden changes in the standings are the order of the day. Leon Haslam: “I can’t wait for Portugal. The ribs are still a little sore but so much better than Donington, also this is a track where we managed a few laps preseason testing and the feeling was really good. I have been 4th in the last few races and I really feel we can get back on the podium in Portugal. It’s a very demanding circuit where Aprilia has won in the past, so this gives a lot of confidence going into the weekend”. Spaniard Jordi Torres also had to battle at Donington. After a less than brilliant Superpole, the best rookie in World Superbike had to ride two comeback races, which is always a complicated situation given the level of the competitors on the track. So for the Portuguese round Jordi has a clear idea of what his strategy needs to be: being faster and more incisive in qualifying, in order to take full advantage of the work done to improve race pace. Jordi Torres: “After two races coming back from behind at Donington Park we’re coming to Portimão with rather clear ideas. We need to be more incisive on Saturday so we can be in the leading group on Sunday. Portimão is a difficult circuit where we’ll verify our potential. We tested here at the beginning of the season even if it was only for one afternoon, so we’ll be starting in better shape than at Donington. We need to be stronger in the qualifying sessions and, above all, we need to keep developing the RSV4 RF. Portimão is definitely a track that caters to our bike and I think we’ll be able to fight for the top positions”.